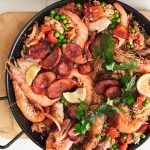 Paella recipes: 14 easy and tasty recipes to choose from! 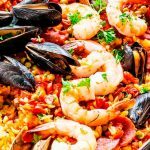 Paella recipes: 14 easy recipes! Paella is not only rice with vegetables, seafood or meat. 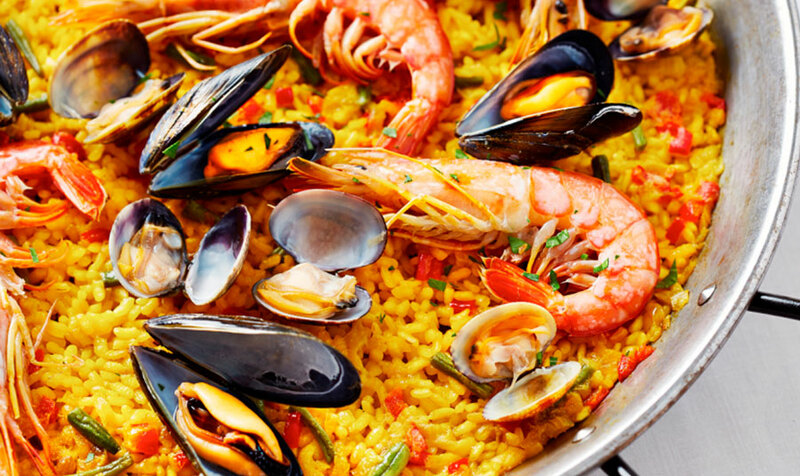 The most representative dish of Spain is the paella. There are a thousand different ways to prepare this dish since it admits practically any ingredient that you want to add to it. In other words, the preparation requires some practice to respect the cooking times and not over-cook the rice, giving rise to the dreaded rice past, but with our recipes and advice, we assure you that its flavor is guaranteed. History of this famous dish. 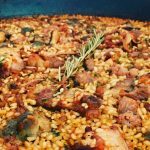 According to experts, this dish emerged in rural areas of Valencia, between the fifteenth and sixteenth centuries, by the need of peasants and shepherds for a meal easy to prepare and with the ingredients they had at hand in the field. They always ate it in the afternoon. 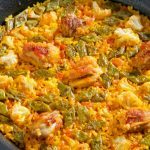 In its origins, the ingredients were the birds, the rabbit of field or hare, the fresh vegetables that were within reach, rice, saffron and olive oil, which were mixed in the paella with water and branches of orange trees. Everything was cooked over low heat. 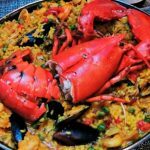 It is a more or less simple task, but to make a good paella recipe of those that are remembered and all those that try it always remember it, is something more complicated. 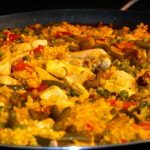 Even more so if what you want to do is an authentic Valencian one and not just any rice recipe with things or other varieties of rice cooked in a paella pan. Here I will tell you the keys to making a good one, the ingredients, the steps, the times and some tricks so that when you make this emblematic dish of the Spanish gastronomy, you are a total success. These tricks are equally valid for all our recipes. It is important that it is cooked over a uniform heat that completely covers the base of the pan. Ideally, it should be cooked over a wood fire to give it a tasty smoky smell, but sometimes this is not possible. Unlike risotto, removing it once it starts to cook is totally forbidden, because we don’t want it to be creamy. In addition, the crunchy brown layer that forms on the bottom, known as the socarrat, is a much-appreciated delicacy. Cook the rice until the rice at the bottom is completely cooked and the rice at the top is almost ready. Turn off the heat and remove the pan from the heat. Then cover it with a tea towel so that it rests for 5 more minutes. This resting period is important because it allows the rice to finish cooking in its own heat and softens the flavors. Warm rice tastes better than hot rice. 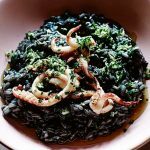 It is sometimes served with aioli, but its garlic flavor dominates the delicate subtlety of the rice. There are certain ingredients that are essential in this dish: rice, chicken, rabbit, green beans, tomato, olive oil, water, saffron, and salt. 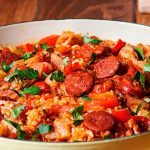 The key to this dish is found in rice, both when choosing it and when handling it during cooking. The most commonly used variety is Bomba rice, a short grain that grows near the village of Calasparra, known for its ability to absorb a lot of water, up to 3 times its volume, without breaking. If you use Bomba rice, you have to add three times as much water as rice. You can also use the Arborio variety, Italian short grain rice that can replace the Bomba. In the case of using this variety, you have to adjust the amount of water because it needs less, specifically twice as much water as rice. Long grain varieties are completely excluded. Another important ingredient is the broth in which the rice is cooked. The idea is to use a homemade broth elaborated with the heads of the prawns or prawns, fennel, tomato, and brandy. If you don’t have time to make broth, you can buy one that is already made, but that is of good quality. Sofrito is a mixture of onion, garlic, and tomatoes simmered to reduce as much as possible. It is the cornerstone of Spanish cuisine. You can add a glass of white wine so that it is reduced before adding the other ingredients, thus giving it a finish with a unique richness. More info about the history of the sofrito. Many times tomato paste or crushed tomato is used when natural tomatoes are not available. 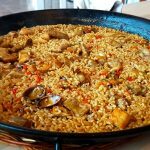 What kind of Paella pan do I need to cook this recipe? 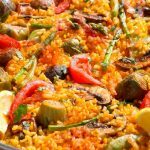 This is the most important thing about how to make a Paella recipe of your choice. 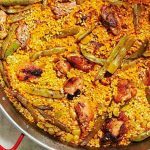 To make this dish perfect, it should be cooked in the container of that name paella pan (paellera), and if possible with wood fire. 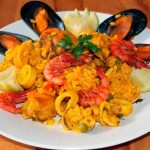 The taste of sofrito, rice, and seafood is incomparable. In our houses, we can make it on a gas stove, induction or on vitroceramic, but it will never be the same. 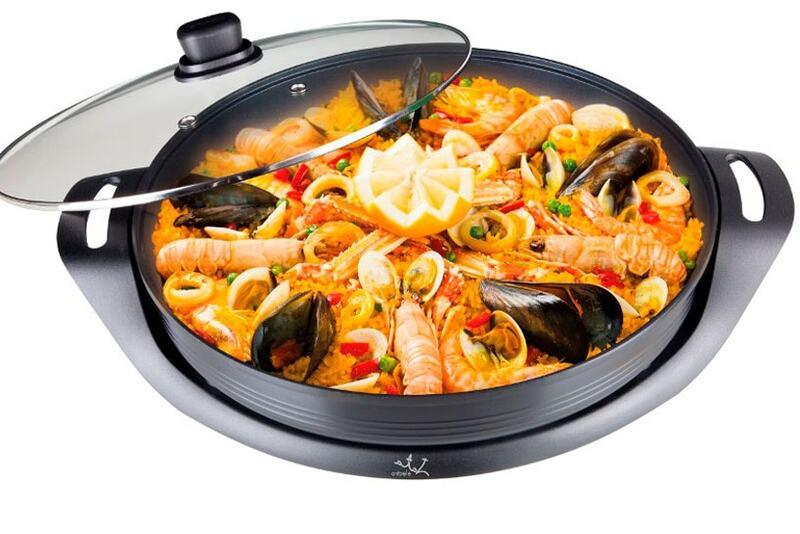 Of course, the most practical thing is to buy an electric paella pan. Due to their size and temperature distribution, they are perfect for making this dish. The main thing when buying this electric pan is to know how many portions we will need to prepare. What size pan should I buy? As for the measurements, it will depend on the number of people you want to feed, to ensure the rice always remains widely distributed in a thin layer. The indicative measures are: a pan of 40-45 cm for four or five people, a pan of 55 cm for 8-10 people, a pan of 65 cm for 12-15 people. It is not the same, if we are going to make it at home for us and our partner, or if we are making it for friends and family. Normally the electric paella pans have a glass lid, which helps us to see how the rice is made without having to lift it. Remember, removing the lid (even for a moment) lowers the temperature. 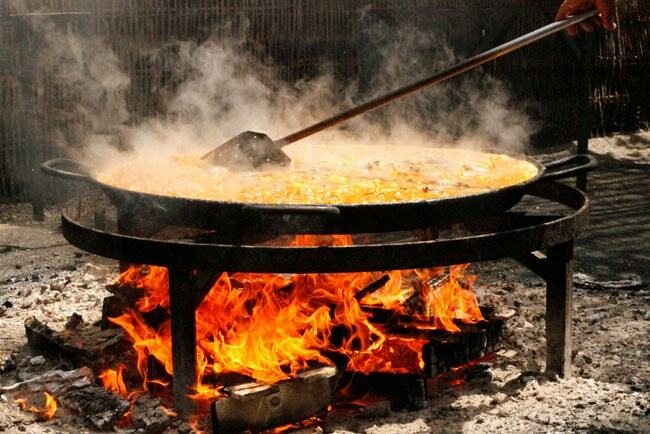 Then it’s just a matter of practice, and you will catch “the trick” to your paella pan. It is always preferable to use saffron to give color and flavor to this dish. 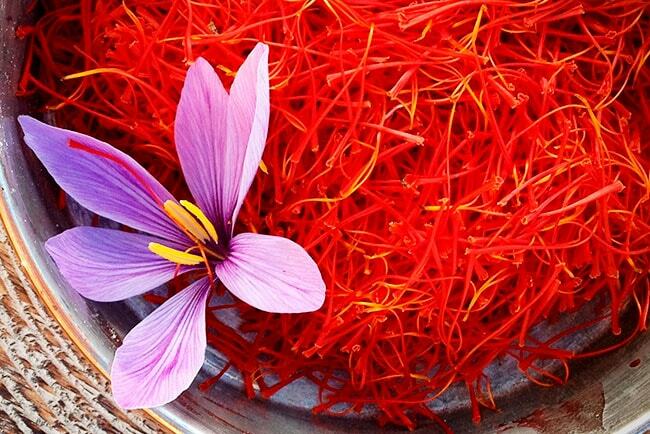 Many use food coloring to save money, but the amount of saffron that is needed is very little and compensates. One ingredient has nothing to do with the other. There are always small controversies as to which ingredients to bring (we love you Jamie Oliver!) 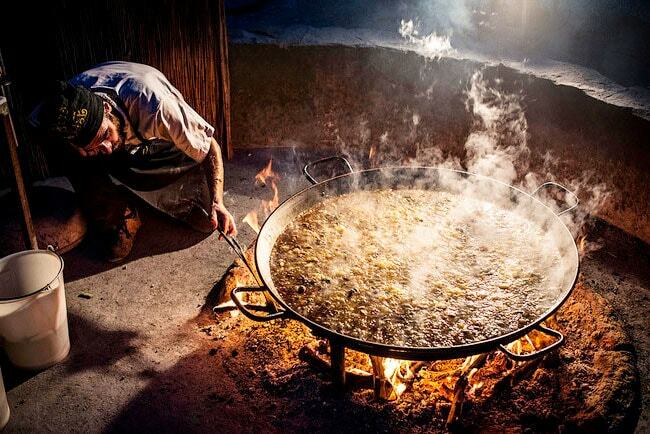 or what is the true origin of this Spanish dish. Although that’s all right, the important thing is to enjoy Spanish cuisine. Both for its taste and for the company. All food tastes better if eaten with family or friends. 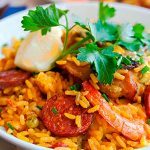 Rice with things is not a paella!